Prosody and Verb Placement Research question: Do Explicit Prosody and Verb Placement modulate listeners PP-attachment preferences in the processing of. Download ppt "Prosody and Verb Placement Research question: Do Explicit Prosody and Verb Placement modulate listeners PP-attachment preferences in the processing of." IA/Spring Task Design EL441 Introduction to Teaching Young Learners Nilüfer Demirkan-Jones Session 3. CLL Session 5: L2 Processing LAEL, Lancaster University Florencia Franceschina. 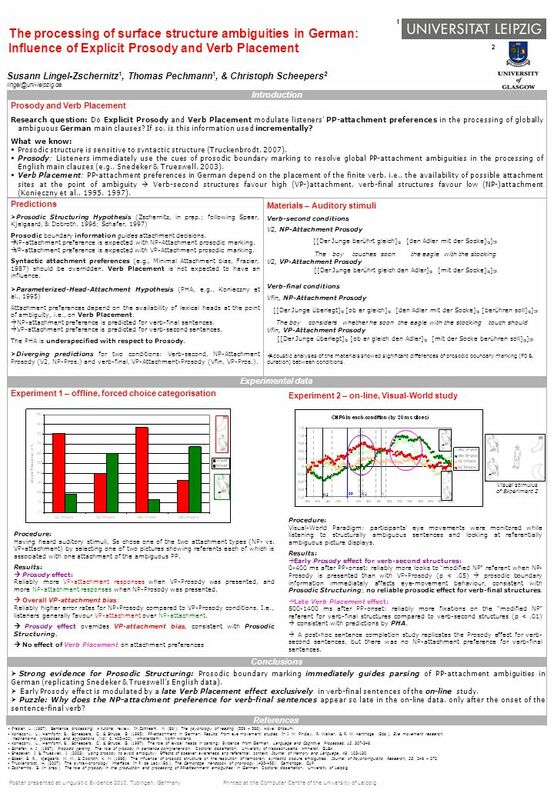 Another word on parsing relative clauses Eyetracking evidence from Spanish and English Manuel Carreiras & Charles Clifton, Jr.
Eva Fernández 1,2  Dianne Bradley 2 José Manuel Igoa 3  Celia Teira 3 1 Queens College & 2 Graduate Center, CUNY  3 Universidad Autónoma de Madrid AMLaP. The prosody of ambiguous relative clauses in Spanish: a study of monolinguals and Basque- Spanish bilinguals Irene de la Cruz-Pavía & Gorka Elordieta UPV-EHU. STAGES OF COMPREHENSION discourse modelling semantic analysis syntactic “parsing” lexical access phonemic analysis sensory processing. Eye Movements and Spoken Language Comprehension: effects of visual context on syntactic ambiguity resolution Spivey et al. (2002) Psych 526 Eun-Kyung Lee. Sentence Processing III Language Use and Understanding Class 12. 18 and 24-month-olds use syntactic knowledge of functional categories for determining meaning and reference Yarden Kedar Marianella Casasola Barbara Lust. The Interaction of Lexical and Syntactic Ambiguity by Maryellen C. MacDonald presented by Joshua Johanson. Sentence Processing 1: Encapsulation 4/7/04 BCS 261. Foundations of psycholinguistics Week 3 The beginnings of language acquisition Vasiliki (Celia) Antoniou. Prosodic facilitation and interference in the resolution of temporary syntactic closure ambiguity Kjelgaard & Speer 1999 Kent Lee Ψ 526b 16 March 2006. Theeraporn Ratitamkul, University of Illinois and Adele E. Goldberg, Princeton University Introduction How do young children learn verb meanings? Scene. SPEECH PERCEPTION 2 DAY 17 – OCT 4, 2013 Brain & Language LING NSCI Harry Howard Tulane University. Using prosody to avoid ambiguity: Effects of speaker awareness and referential context Snedeker and Trueswell (2003) Psych 526 Eun-Kyung Lee. Nuclear Accent Shape and the Perception of Prominence Rachael-Anne Knight Prosody and Pragmatics 15 th November 2003. Understanding Pronouns Jennifer E. Arnold University of Pennsylvania. Background Dissociation: ◦ Lexical-gender (king) - recovered directly from the lexicon ◦ Stereotypical-gender (minister) – inferred from pragmatic information. Wilson, “The case for sensorimotor coding in working memory” Wilson’s thesis: Items held in short-term verbal memory are encoded in an “articulatory” format.